I’m sneaking in here with one last quilt top from 2016. It’s actually been done for some time now, and I even took photos during the fall, but then apparently failed to actually post about said quilt top! We got some snow today, so I took the opportunity to snap a couple extra photos of this one. Snowy quilt photos are always good, no? These fabrics are beautiful screen printed fabrics by Karen Lewis, and were available through her fabric club in the fall of 2016. I was honored when Karen asked me to select 12 Kona colors for her club, and was so pleased when I received this bundle in the mail. I immediately set to work making a quilt with them. I initially paired them with a solid gray, but then decided I liked this patterned gray print better. From afar it reads as a solid gray, but up close there’s a little extra pattern going on. I can recall now what prompted this design – I suppose it seemed like a good way to get the most out of my fq bundle! I cut all the strips by hand, and love the wonkiness it lends to these lines. After using up all the prints, I decided the quilt needed a bit more width, so I made up these mini blocks using similar solids. It’s not going to be a finished quilt for 2016, but I’m glad I snuck at least one more quilt top in for this year! Wishing you all a very happy New Year! Thank you to all who continue to read and a giant thank you to those who take the time to comment! 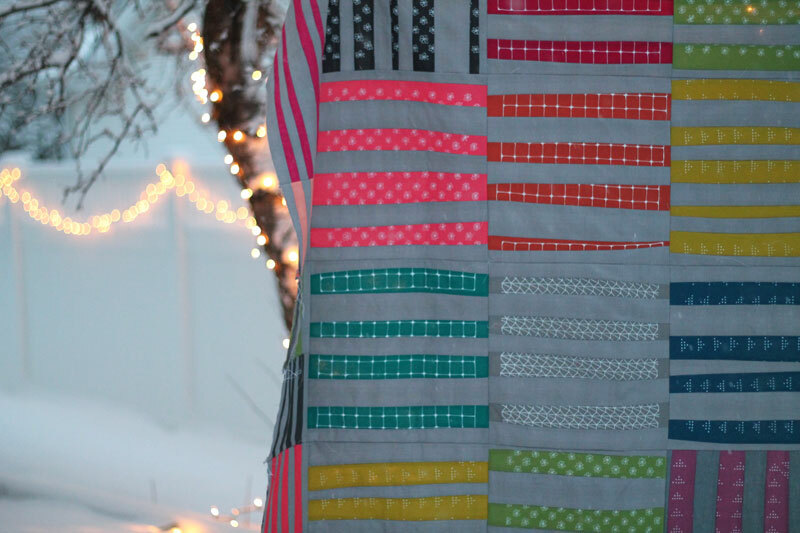 I look forward to sharing many more quilts (or quilt tops!) with you in 2017. 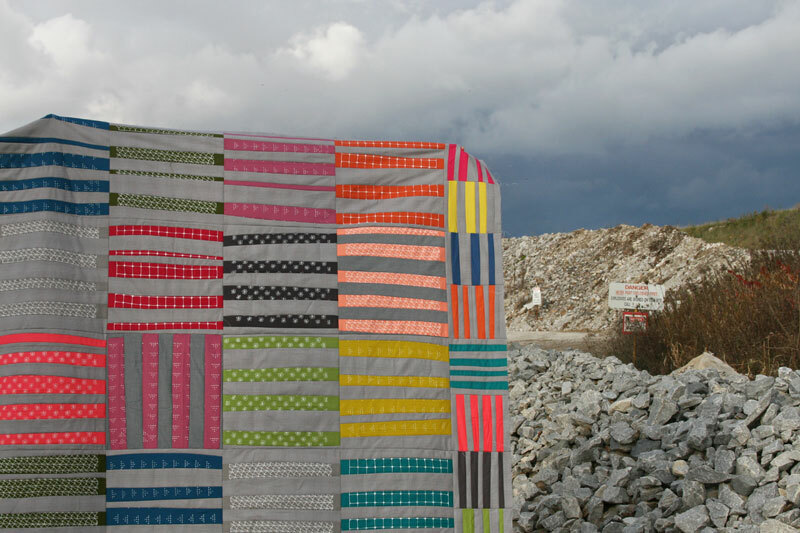 And hey, maybe this is the year I’ll finish up some of those quilt tops from 2012… heh! This entry was posted in Fabric, Posts about Quilts and tagged fabric club, karen lewis, quilt, quilt top, screen printed fabrics. Bookmark the permalink. I do think I favor the snow background. Love your quilt. 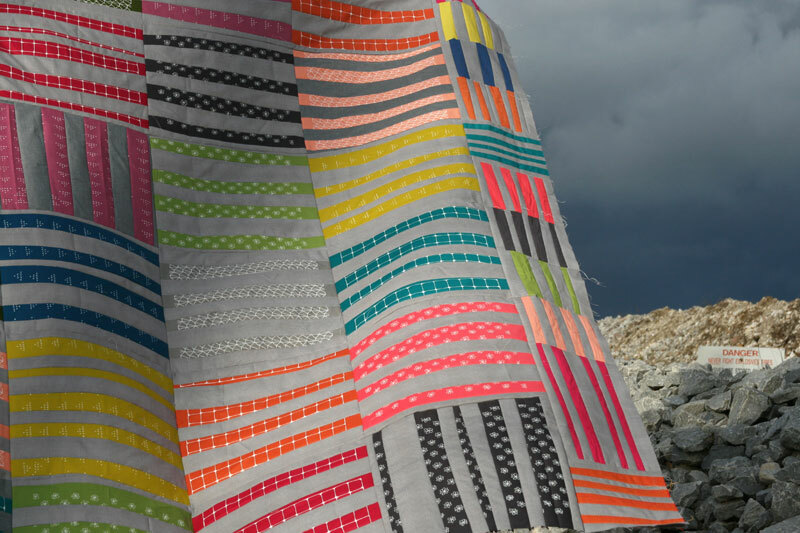 It’s amazing how the simple designs make such striking quilts! Happy New Year Ashley! Love your improv strips. I love the wonky strips! Thank you for sharing your quilts. A great way to showcase some unique fabrics! Love this one. It looks like it’s lit from behind; it glows! Lovely. I really like this one, especially with the gray mixed in. I drew a design once that was similar, something like a rail fence but with longer strips but hadn’t figured out how I wanted to make the blocks. This encourages me to play around with it! Another beautiful,quilt! Thank you for sharing your creativity! This is gorgeous!! I love how colorful and love the wonky strips!! Happy New Year! happy new year! I especially love the skinny stripes in this! and someone has to keep making the quilt tops! what else would we do with all that fabric?? Love the gray with the bold colors and simple design. Admire the beautiful snow and lights too…. Thank you for sharing. I’ve been trying to figure out what to do with some of my C&S fat quarter bundles. 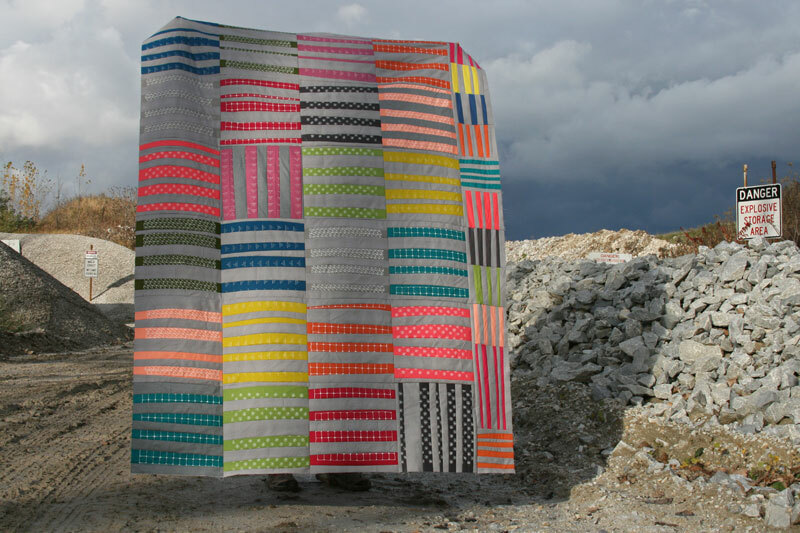 Your quilt is a winner! Thank you for all the inspiration you give me all year long! Love your blog. Happy New Year!! Sometimes the tops that haven’t been quilted make for the pictures–this one fairly sparkles and glows as the light shines through! 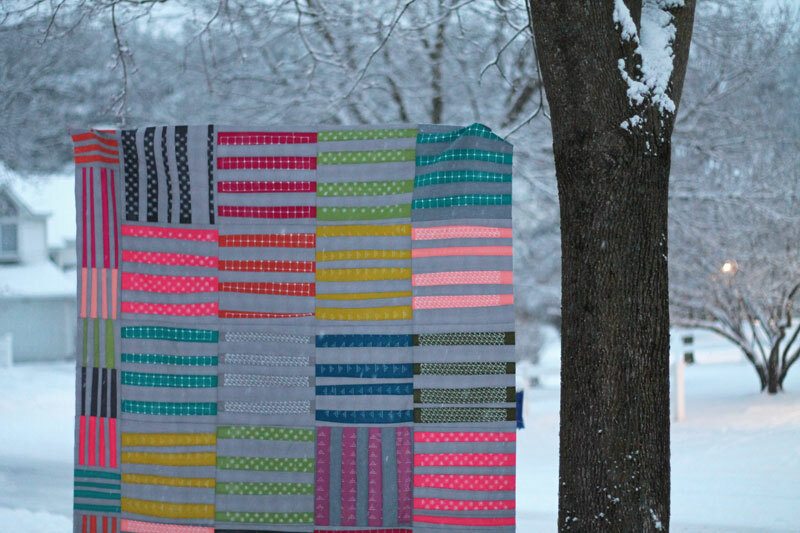 Thanks for sharing your quilt pictures, and I hope you know how much I have enjoyed seeing glimpses of your sweet family. Happy New Year to all of you! Fantastic quilt! I love how those steel grey clouds showed up for your photo shoot too. They really complement your fabric choices. 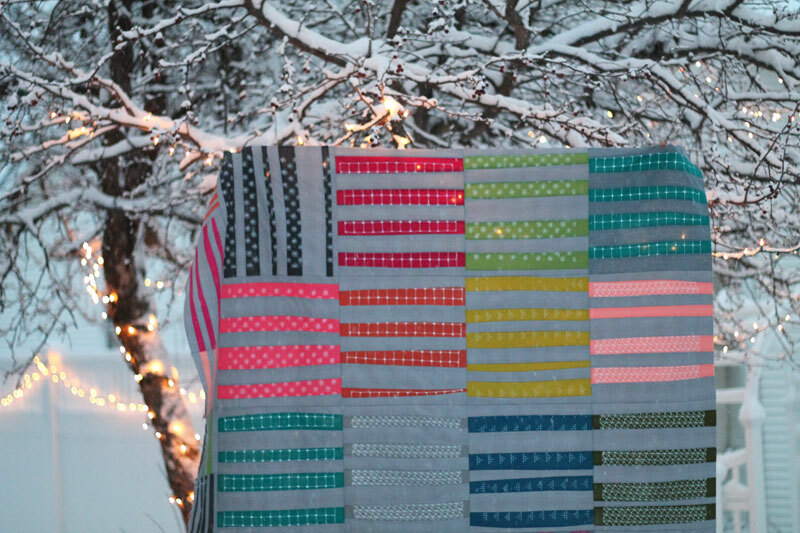 Love the quilt/snow photo. Happy New Year. I look forward to your posts. Happy New Year most talented Lady. Looking forward to following you in 2017. Love the snowy background with lights in the trees! Happy New Year! I love how you just go for it! Happy new year! looking forward to seeing more of your creativeness in the new year.